Every programming language including SQL follows a specific set of guidelines, linguistic rules or patterns termed as Syntax. Each mathematical operators, special characters, spaces, etc., have a specific meaning when used in SQL query statements. For example, every SQL query or command must end with a semicolon (;). SQL error message will appear on your screen, if you are executing a SQL command or query that does not have a proper format or syntax. Error SQL Syntax is the most common error experienced by the new SQL developers. While working on query of database, there is a possibility of facing the database errors or SQL syntax errors. Here we explain about the SQL Server Error 1064 which may appear on your screen because of wrong SQL Syntax. You can easily track down the errors in MS SQL by following below mentioned steps. 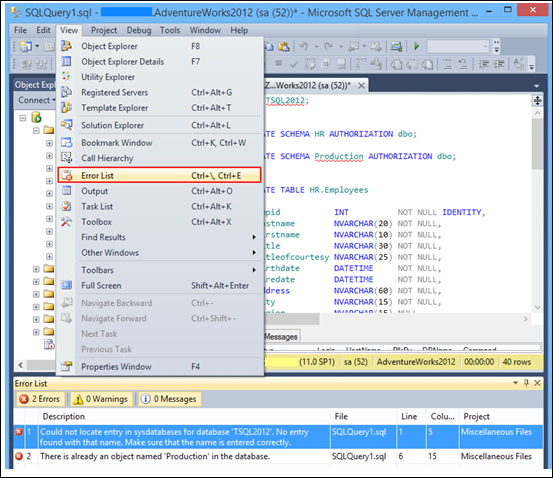 The Error List pane will show you all the errors found in SQL query. The Error SQL Syntax can have multiple causes. Some causes which can lead to a syntax error in SQL query are mentioned below. How to fix Reserved Word Problem? There is a special requirement to use a reserved word as a table or field name in SQL query. To run the SQL query having reserved word as table name, use a back ticks (`) just before and after that reserved word as shown below. MS SQL engine will get confuse and show an error message when you execute the above mentioned command. How to fix Missing Data issue? Go into the respective database (within my admin), select the particular row from the table and then manually add the correct data. The most common cause for the SQL syntax error is mistyping of commands. For example, if you run the below mentioned command in MS SQL Server it will show you an SQL syntax error because UPDATE command is accidently misspelled. How to fix Error SQL Syntax? It is possible that some commands become obsolete and removed from SQL. You will see the SQL syntax error message when you use those commands in my SQL, because now those commands are not valid for SQL Statement. For example, TYPE command has been depreciated since MS SQL 4.1 and finally removed from version 5.1. Now the TYPE command has been replaced by the ENGINE command. You will get an error SQL syntax message if you will run the following command in new version of MS SQL. The TYPE command should be replaced by ENGINE. Finding SQL syntax errors may be complicated; however the aforementioned Error list can help you to check errors while writing the projects and avoid searching of errors SQL syntax after writing the complete code. Sometimes the database can get corrupted due to such SQL Syntax errors or due to any other reason. 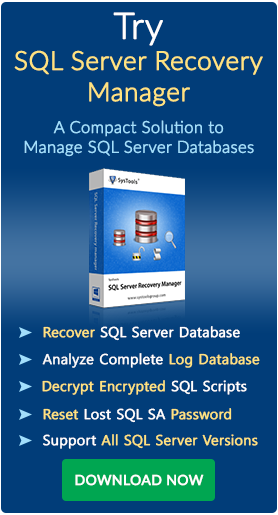 In that case you can use SQL MDF recovery tool to fix error SQL syntax and view corrupted database of MS SQL Server.